The starting point of this ride is a parking lot on the western side of Flagstaff Road. Meyer's Gulch is a relatively mellow ride along an old dirt and gravel road. 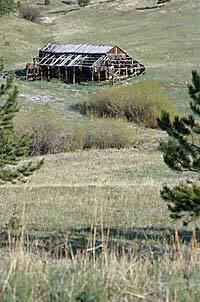 As you continue past the ruins of the mountain meadows, aspen groves and Ponderosa pine. After approximately 700 feet of elevation gain and 2.5 miles, the trail dead-ends at a great lookout point. The ride back down is as fast as you want to make it. The more adventurous will find plenty of banked turns and bumps to catch air on during the descent.